USG Structo-Crete™ structural concrete panel for floors is a breakthrough in building – lighter than precast and poured in place concrete, Structo-Crete panels' high compressive and flexural strength allow you to build higher for less. Structo-Crete™ structural concrete panels are the only non-combustible structural cementitious panels both manufactured and available in the United States. 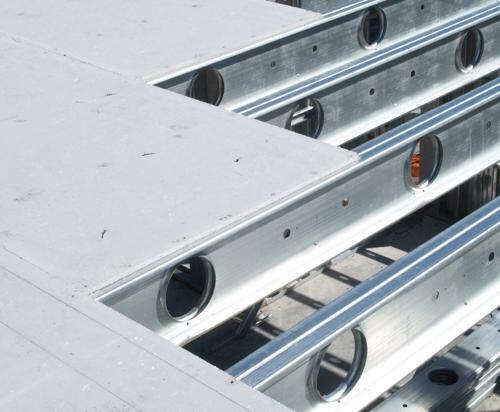 They are mechanically fastened to cold-formed steel joists or framing members. A noncombustible ceiling assembly is attached to the bottom of the floor joists to complete the construction. This floor system is designed to carry gravity and lateral loads. Finished floor materials, such as carpet and pad, may be applied directly over Structo-Crete structural concrete panels.